A source close to the Glastonbury festival has confirmed to GlastoEarth that the role of Q Magazine will be cut in 2011. Bauer Media's high profile music publication had backed the successful Queens Head venue since 2007, as well as producing the popular free daily newspaper for the festival. 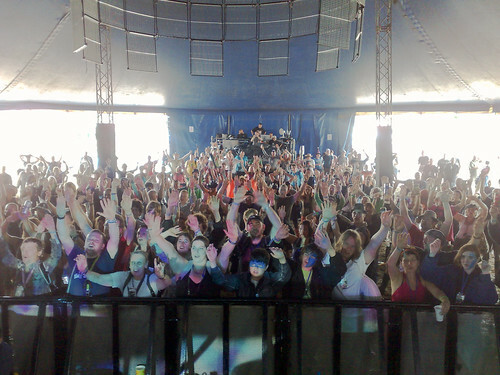 In 2009, Q Magazine broke an embargo on publishing the full festival line up, provoking ire from organiser Emily Eavis in a BBC interview shortly after. The magazine later tweeted a public apology to The Guardian, who had been part of the three way embargo agreed with the festival. The Queens Head will now come back under the direct control of the festival organisers. The source was unequivocal about building on the success of the venue, revealing that the same booker is on board. Underlining their belief that he's the man for the job, the source revealed: "Some of the bands he booked for the Queens Head last year, will be playing the Pyramid Stage this year. ", but quickly added that they do not want to repeat the overcrowding that happened when Maximo Park opened at the indoor stage in 2009. The venue will move to Oxylers, in a location understood to be close to the Dance Field. The Queens Head's previous location will be taken by the Billy Bragg led Leftfield tent. The reappearance of the daily newspaper, previously published by Q, is also reassured. Discussions are taking place about taking it in a new direction, possibly becoming an in-house publication, although decisions about the format aren't expected until much nearer the festival. Q Magazine's Festival Review, produced independently from the festival, will still be sold on site to the departing crowds on the Monday. Elsewhere, Sony will not be bringing back their Cocktails and Dreams venue. The entertainment giant, who upsized their PlayStation linked presence in 2010 to take over the site vacated by The Guardian Lounge, will not return this year. Plans for the site, close to the Pyramid stage, are still being considered by the organisers. Article (C) GlastoEarth 2011. Photo by TheHuxCapacitor, Flickr. Used under the Creative Commons Licence.